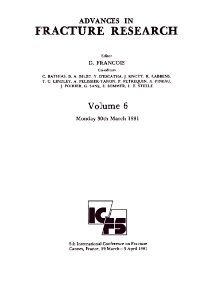 Advances in Fracture Research, Volume 6, documents the proceedings of the 5th International Conference on Fracture (ICF5) held in Cannes, France, 29 March-3 April 1981. The conference was attended by 670 participants from 26 countries. The program consisted of plenary sessions with invited speakers, technical sessions with contributed papers, a poster session, and two round table discussions. This volume contains 14 papers that deal with topics such as advancements in fracture mechanics; the application of fracture mechanics in three areas: damage tolerance requirements for aircraft structures, toughness requirements for bridges and heat up and cool down schedule, and evaluation of in service NDE indications for nuclear pressure vessels; and the analysis of crack-tip stress and strain fields for stationary and growing cracks in inelastic solids under monotonic loading. Also included are papers on the impact of environment on fracture; the problem of fracture of large concrete structures; and microcracking in hydrogenated austenitic steels.